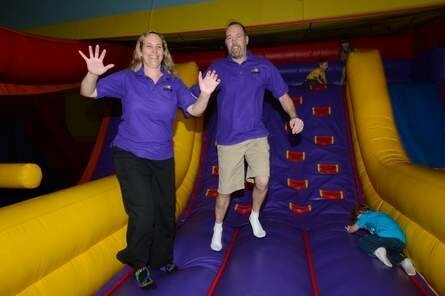 The Mannerings had never run a business and both had good jobs when they began investigating the idea of building and operating a self-contained recreation center filled with inflatable jumps, slides and obstacle courses aimed at children age 2 to 13. “In 2010, we only had a concept of what we thought would be a really good business idea,” Jennifer Mannering said. Their main SCORE mentor was Tom Latimer whose background included helping to manage a large manufacturing business. Latimer brought in a second SCORE mentor, Bob Melberth, who had experience in franchising. Between the two, the Mannerings found themselves going back to the drawing board several times to refine their business plan. They also made dozens of phone calls to other operators of similar establishments and found they could learn a lot from those in other cities who felt no direct competitive threat.